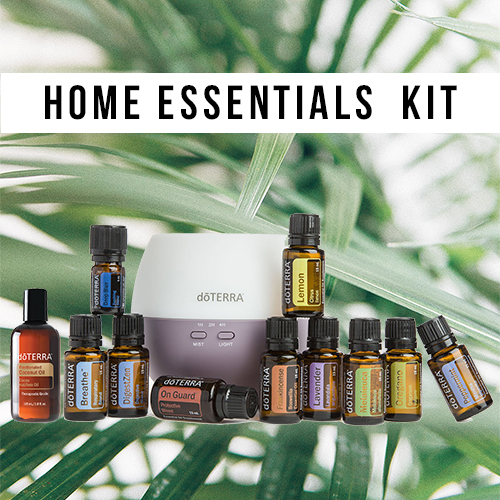 With this kit you’ll also gain access to my private Facbeook group with all online training on how to get the most out of your oils. I run weekly LIVE classes and will teach you everything you need to know. You won’t just get the kit and be forgotten. I promise! You’ll also have access to THE PATH TO WELLNESS website which is designed to walk you through everything you will need to get started with your oils. It may be hard to believe right now, but these oils are truly life-changing in SO many ways. You are about to step into a world with such huge amounts of love, support, community, health, inspiration, and information. Our community honours your health as a whole, where your physical, environmental, spiritual and mental health are all considered and supported with these oils. 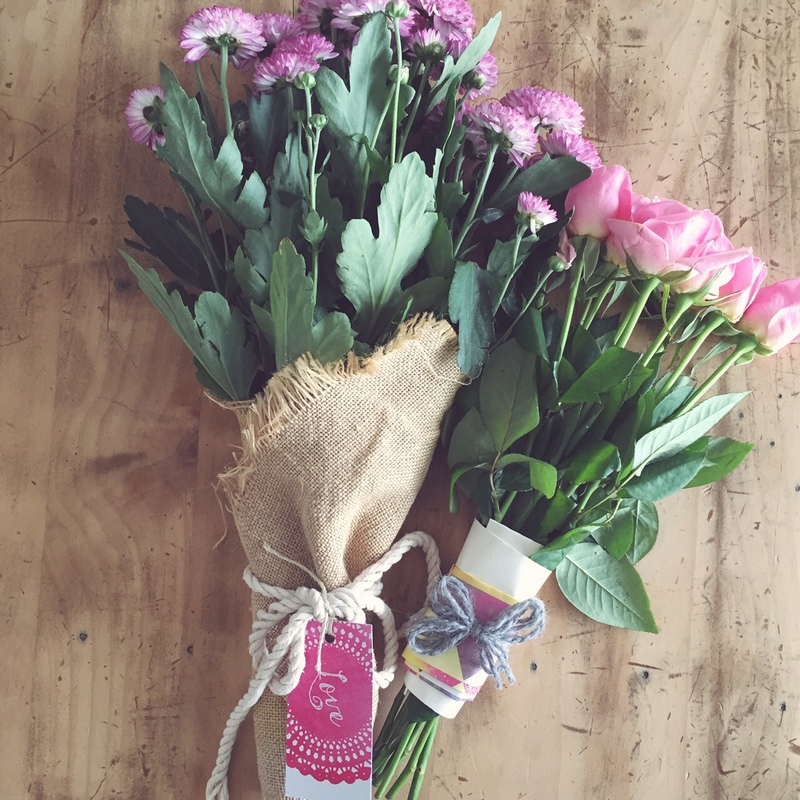 20% off for a limited time ONLY. 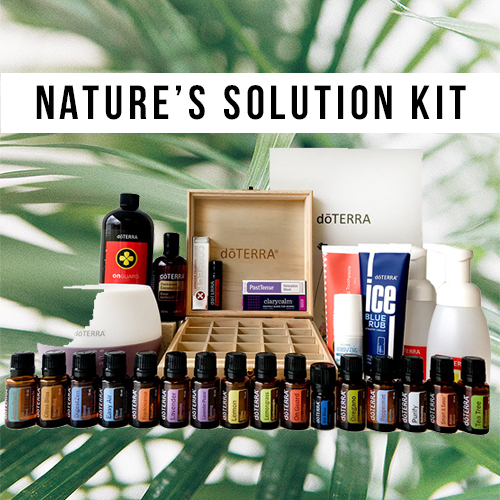 Experience the power of doTERRA essential oils and products through the Nature’s Solutions Enrolment Kit. 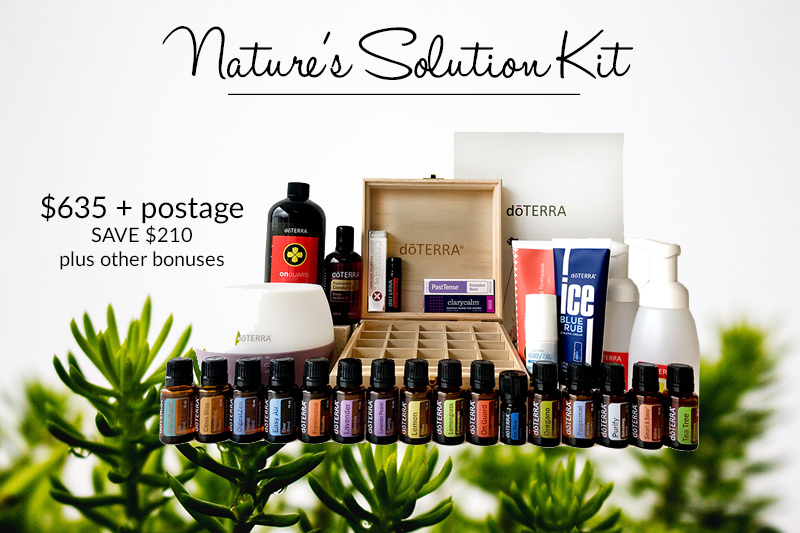 This kit is a perfect companion to assist with achieving your wellness goals! Past Tense, Clary Calm, DigestZen, Purify, Tea Tree, Oregano, AromaTouch, Frankincense, Lavender Peace, Easy Air, Citrus Bliss, Lavender, Lemon, Peppermint, Smart & Sassy, Lemongrass, On Guard and Ice Blue. Ice Blue rub, Correct-X, Fractionated Coconut Oil, Easy Air Vapour Stick, Petal Diffuser, Wooden Box, On Guard Cleansing Toothpaste, On Guard Foaming Hand Wash with 2 dispensers, On Guard Beadlets, Introductory packet and Enrolment. Read more about these oils here. 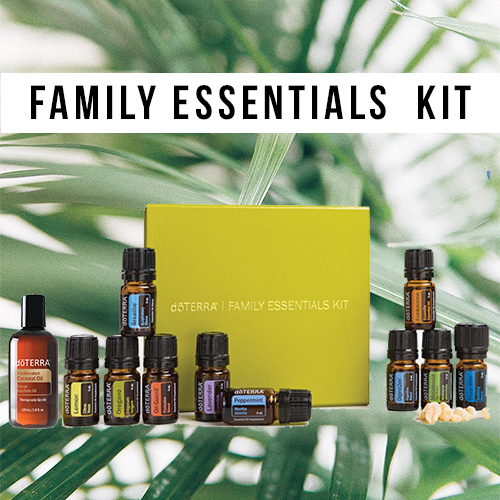 You are purchasing a doTERRA Wellness Customer Introductory Pack including a Wholesale membership. 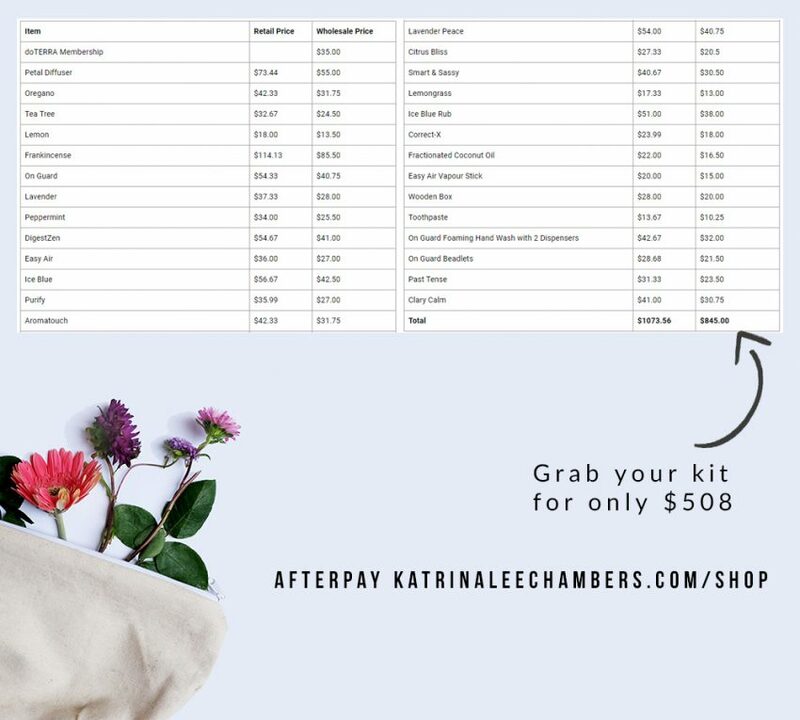 If you place a 2nd order in the following month you will receive 100 loyalty points to spend on products. Conditions apply. Please contact me to find out more. Wholesale membership gives you 25% off doTERRA’s retail prices for 12 months. 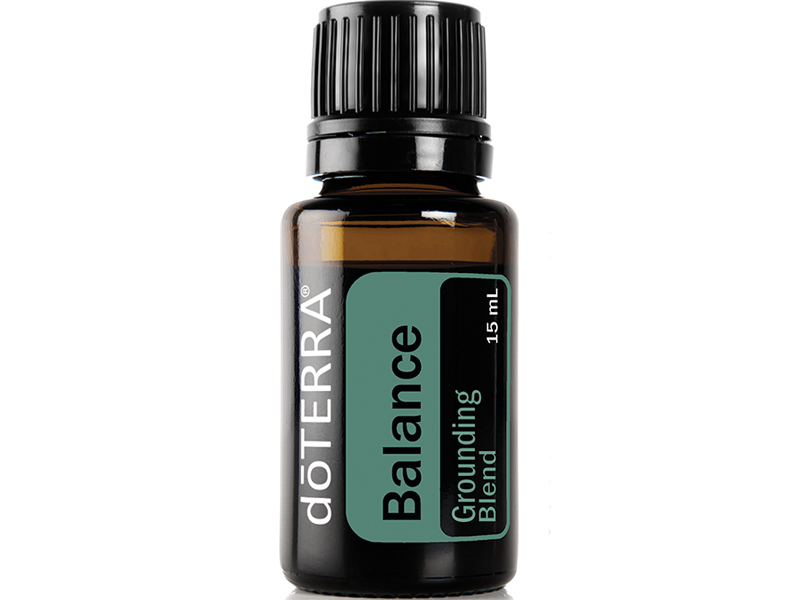 You get your own account and can choose to buy directly from doTERRA moving forward after this purchase. Following purchase of this product, I will be in contact to explain how to complete your membership and use it to its full potential. You’ll also have access to my private Facebook group where I give you daily support on these gorgeous oils. ** Parcel will come directly from doTERRA and a separate shipping number will be sent. Please allow 7-10 days.